Bar owner characterizes efforts as "a day late and a six-pack short"
Salt Lake City, Utah (CNN) -- For Art and Jaynie Brown, the anti-alcohol crusade began with a late-night phone call a decade ago. 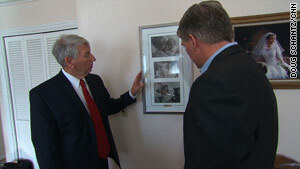 "From my daughter," Art Brown explained at his Salt Lake City home. "And she simply said, 'Dad, we've been in a very serious accident.' "
The Browns rushed to the hospital where their grandchildren were taken after the crash. One of the boys was seriously injured; the other was in more dire condition. "I guess the most poignant time in my life was when I had to watch my daughter and my son-in-law pull life support off that baby," Brown said. "Twenty-four hours before, it was a loving family." Matthew was 2 months old, killed by a drunken driver. Brown learned the details from the police report. "He had been served, over six hours, 21 drinks," Brown said. "When he got a little rowdy, they threw him out, and he got in his car and drove around, and he hit our daughter. Three times the legal limit." Art Brown now heads the Utah chapter of Mothers Against Drunk Driving, and the Browns are frequent visitors to the state offices to push for more aggressive efforts against drunken driving and for public campaigns to raise awareness about the dangers of underage drinking. Utah's laws are among the toughest in the nation, and Brown is quick to praise state officials and Salt Lake City Mayor Ralph Becker for their efforts. At the moment, however, Brown is at odds with the mayor over Becker's plan to modernize city alcohol ordinances, including abolishing a limit of two bars per city block and making it easier to locate a bar near residential neighborhoods. "The 'wetter' you make it for the kids where they live, the more probability there is going to be an upward pressure on their choice to drink," Brown said. "If they see that you are willing to put it next door to them, that it's pleasurable, it's the thing to try, there's no downside to it." "I certainly understand and respect Art Brown and others' points of view that having a place that serves liquor is an inducement for minors to drink," Becker said at his City Hall office. "I just haven't found that to be the case in my own experience, and I don't think the information in studies supports it, either." Art Brown became an anti-alcohol crusader after his grandson was killed by a drunken driver. Becker describes the changes as part of an effort to make the city more attractive for new residents and businesses. "We are providing for what people in neighborhoods want," the mayor said. "They want to be able to walk to their neighborhood restaurant and have a drink with dinner. Not everybody, but some people do, and we have to provide for everybody in our community." It is a debate that is not unusual as cities across America debate new urban planning models. But it is perhaps more controversial and noteworthy here because Utah, the home of the Church of Jesus Christ of Latter-day Saints, for years has had some of the nation's most restrictive liquor laws. The Mormon Temple is a Salt Lake City landmark, and the church's influence in the city and across the state remains enormous. But the city is now majority non-Mormon, and Becker says his job is to promote -- and encourage -- those differences. "We have an enormously diverse culture here," the mayor said. "We live in as beautiful a natural setting as there is anywhere in the world. And part of what we need to make sure people understand who come to visit here and who look to locate their businesses here and live here is that everyone is welcome here." It is an attitude bar owner Del Vance calls long overdue. But even as he compliments Becker for pushing for changes, Vance says they will in the end prove meaningless unless the state agrees to issue more liquor licenses. "Like everything else here, it is a day late and a six-pack short," Vance said at the Beerhive. "Because now the state is out of liquor licenses, so even if someone wanted to open another bar on this block, they couldn't." The state also controls liquor sales, and to Vance, it is proof that the church still dominates Utah politics despite shifting state and city demographics. "Obviously, Utah is associated with Mormons, and they don't consume alcoholic beverages," Vance said. "I don't understand why people think, 'If I don't do something, I've got to make it more difficult and aggravating for the person who does it.' "